This is a regular blog post. If you’re looking for show notes or links to show audio, please check out the other entries. 2.5 yesterday KPTK-KMBS-KPTK. I’m seriously considering the commercial certificate, but I have very little PIC cross-country time to places more than 50 nm away. Partly because I got my instrument rating under Part 141, which doesn’t require PIC cross-country time. So I started the day with 22.6 and ended with 25.1. 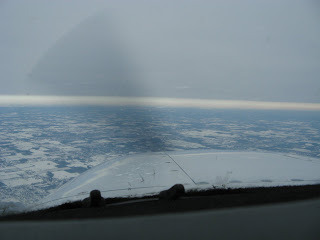 There was a huge 80 to 100-mile wide cloud deck centered on Saginaw, but it was at least 5,000 feet AGL, which allowed us to fly 4,500 MSL on the way up and 5,500 MSL on the way back. Shot the ILS Rwy 23 and did a pretty decent job of it. This is also my third flight in the 172RG. I’ll have the 10 hours of retractable time required for the commercial done in the next flight or two, but I think I’ll probably fly this aircraft for the checkride (whenever that happens), so I have no problem getting a lot more time in it. The other objective was to go see the commercial maneuvers and, in particular, chandelles, lazy eights, steep spirals, and eights on pylons. We haven’t has ceilings that would allow for these maneuvers on any of my prior scheduled flights this year in the RG, so I was really pleased to finally get to do them. So I was really pleased by my performance yesterday. Yeah, I have some polishing to do on a lot of the maneuvers, but I actually flew them reasonably well! I think I love lazy eights. Everything changing in all three axes, but changing at rates and with relationships that you command. And Chandelles are just plain majestic on a cold day when you get really nose-up and climb with brute strength. Maybe I got the kinesthetic sense after all in a weird way when attitude instrument flying finally clicked for me. 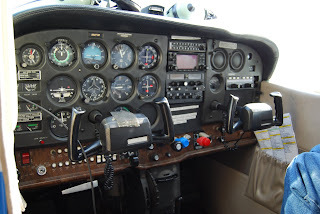 I do attitude instrument flying very well and maybe the hood made me pay attention to what was going on empirically (according to the gages) so that I can nail stuff like that now VFR. Even with the distraction of a view out the window! Anyway, I can see a lot of trips to Saginaw in my future, as well as training for the commercial maneuvers. I have a lot of time to build before I’m qualified to do the checkride, but hey – it’s flying. Please don’t throw me in that briar patch! The obligatory CFI shot. Meet Dale. 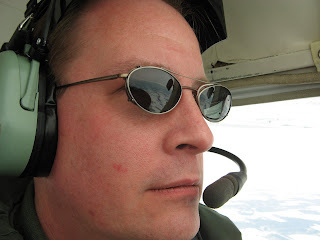 He’s a graduate of Western Michigan University’s aviation program and flew well on the commercial demonstrations. This is the thi9rd different CFI I’ve had in three flights in the RG. Everyone’s a little different in terms of how he or she flies and teaches and that’s fine. But I need to come up with my own checklists and flows for this aircraft. More than once I had an issue with the gear. Nothing huge. I don’t think that I would have landed gear up. But nearly-as-stupid things like wondering why climb performance sucked so badly after recovering from eights on pylons and heading for home. And then having Dale remind be that we could bring up the gear if we didn’t want to dangle them all the way home. I do fear the gear-up landing. For myself, I know that mistakes like that are usually task overload. And the best thing for that is to have checklists that I understand and that I can run every time. I think I’ll clear up the gear thing and lots of other issues (prop, carb heat, clearing the engine, and other things that I missed at various times) when I can really sit down with all of the information I’ve received from those with whom I’ve flown the RG and put together my own checklists. Dale had a particularly good flow. Red, blue, green. Red for the mix, blue for the prop, and then green for the gear-down light (and look out the window for a wheel). Probably easier to remember than GUMPS for that airplane. Anyway, I’ll integrate the best of the pest and go from there. CAP Form 5 for round-gage instruments scheduled for Sunday at Ann Arbor (KARB). I’m going to go back to DCT Aviation and fly some sim on Saturday to prepare, but I think I have a pretty good chance of passing. We’re flying a C-172R, N992CP (CAPFLIGHT 2028) and CAP SM Scott Gilliland will also be doing his VFR Form 5 that day. As you might recall, I got Form 5′ed VFR-only in August. They had a C-172P for the check with a panel that I’d never flown. I didn’t want to try to do a full-up instrument checkride on a strange panel, so I elected to go VFR only. Now that I have the chance to fly a C-172R (in which I have something like 80 hours in model and five hours in this particular aircraft), I feel good to go for the instrument ride. It has an Apollo GPS, which which I have only the most rudimentary VFR experience, but we’re not going to be flying any RNAV approaches. Still, I like having the instrument approach overlays for situational awareness and I need to get through the manual before Sunday to see if I can get that part down. I did the weight and balance and, as long as we launch with 30 gallons of fuel or less, we can probably fit all three in the aircraft. Might be cool. I haven’t ridden in the back seat of a C-172 since I was a kid. Might be nice to see someone else fly for a change. Of course, that means a peanut gallery for my part of the ride, but Scott’s a good guy and will probably remember to reposition his mic before laughing out loud. Administering the ride will be check airman Capt Alex Craig, who has solid aerobatic and other credentials and flies a Bonanza when he’s not serving with CAP. As always, I enjoy objective tests of my pilot skills. And a CAP Form 5 check is always a worthy test. This is a regular blog post. Please see other entries if you’re looking for wshow notes or audio. 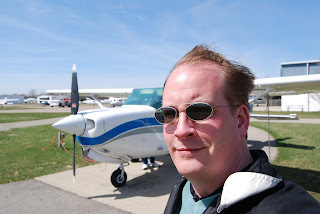 Just got back from the Cessna event at Willow Run. No time to write much at the moment (going out for some tailwheel this afternoon), but lots of good pictures and other stuff to come. This is a regular blog post. Looking for show notes or links to show audio? Please browse the other posts. Started the checkout in the RG yesterday at Flight 101. Wind 240 at 14, gusting to 22. (Active runway 27L-R.) Peak gust 26 and bizjets reporting shear of plus and minus 15 on final. That’s not bed-head in the picture. The wind was even blowing back the gel. But we got up. 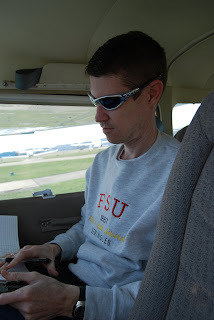 This is the first flight of the checkout in the Cessna 172RG (the Cutlass). Flight 101, the FBO to which I’m transitioning for my airplane rental needs, has 152s, 172s, a 172RG, and Diamond DA40s. Checking out in the RG qualifies me for all of the other Cessnas on the line, so it’s efficient to go up in the RG, even if I need five hours in which to check out. Plus, I’m scheduled to go for multi training with Traverse Air this weekend and having a little experience with a complex aircraft would be a good thing. Plus, I needed to go land something – anything – a few times to get the muscle memory back. I’d flown only twice since the instrument checkride last October and even that flying involved only two takeoffs and two landings (although I got an IPC out of the February flight). There’s a lot to learn. I’m really glad that I flew something complex before getting into Tom Brady’s Apache. I understand constant speed props better now and also have a better sense for how busy I’m going to be on takeoff and landing. I goofed up the first takeoff for the simple reason that I hadn’t positioned my seat correctly. The dash is a little closer to the pilot in relation to the pedals in the Cutlass than it is in the late-model 172Rs to which I’ve become accustomed. I set up the seat to put the throttle about the right distance for my arm. Taxiing was okay, so I figured that the pedals would be fine. So I gave her full power and immediately went left because I couldn’t get enough pedal travel with my right foot. Lesson learned. Make sure that you get full travel of all of the applicable controls before you get to the hold short line. Here’s the cockpit. The blue knob is the prop control, the gear lever is to the left of the carb heat, and – yeah – there’s carb heat (after having flown fuel-injected aircraft since 2003). Procedures also call for using the electric fuel pump on takeoff and landing and that switch is at the far left. Plus, there are cowl flaps that you need to close to help avoid shock cooling of the engine. It’s nothing that thousands of pilots don’t deal with every day, but it’s new to me and I was as busy as a one-armed paper hanger in the pattern. After a couple of steep turns, we headed over to Romeo to use Runway 18, where the wind was a little closer to the runway heading. It was a little too bumpy anywhere below about 5,000 feet to do slow flight productively, so we’ll do the rest of the high airwork later. Four full-stop landings. Pretty happy with them except for the third one, in which I imposed a fair amount of side load with a nose-right touchdown. The Cutlass cruises fast and beautifully. And it’s heavier, so it’s a little better behaved in the shear and turbulence. There’s a pronounced difference when the gear comes down. You can really feel the drag. That’s Dr. (!) Andy Mawdsley in the right seat. Nice guy. Very good at letting you know his pet peeves and operational preferences, but doing it in a constructive way. 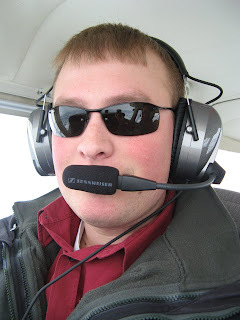 Ever fly with a crusty instructor who seems to be pissed off that you don’t automatically know all of his (or her) foibles and doesn’t seem to care that you might have learned something differently and are performing to the letter of your training? Andy’s not that guy. He took the time to talk for a half hour or so before the flight, helped with the idiosynchrasies of the RG preflight, and gave me a clear expectation of what to expect on the flight. Weather not looking good for the multi training this weekend, but I’ll call Tom today and see what he thinks.